2 Bedrooms, 2 Full Bathrooms, Sleeps Up to 6. This beautiful condo is conveniently located near the entrance to Squaw Valley and is easily accessible anytime of year. We are 2 miles from the ski slopes, 5 miles from Lake Tahoe and 40 miles from Reno. The property has one king bed in room #1 and 2 double beds in room #2. Year round hot tub and saunas, on-site swimming pool, on-site tennis courts, one car garage parking, next to new Squaw Valley Park, linens and towels included, washer/dryer, fully equipped kitchen, hair dryers in bathrooms, gas fireplace, cable TV (2), DVD player, VCR, dishwasher, microwave, stereo/CD player, granite counters throughout, hardwood floors, stainless steel appliances. North Lake Tahoe is internationally known for its fabulous ski resorts (Squaw Valley, Northstar and Alpine Meadows). However, in the winter, you can also enjoy snowmobiling, sledding, sleigh riding, and ice-skating. When the snow melts away, the lake area is perfect for swimming, sailing, windsurfing, motor boating, jet skiing, golfing, fishing, river rafting, horseback riding, biking, and hiking. If all that isn’t enough, Lady Luck beckons from nearby casinos year-round and of course, there are plenty of places to shop to your heart’s delight. Our address is 227 Squaw Valley Road. Directions to the property are: Follow I-80 to Truckee. Take Highway 89 South. From Highway 89, turn right to enter Squaw Valley. The condo is at the Tavern Inn, the first complex you will see on your left. Reno International airport is the closest airport, about 40 miles away. Table has 6 seats; Counter has 2 seats. The beds were very comfortable. Kitchen has basic cook wear. Bring your own spices if you are planning on cooking there. We enjoyed our stay. Condo was convenient toSquaw Valleyand Alpine meadows. Indoor parking was great as it snowed almost everyday. I would reccomend staying there as the host Ying was very receptive and was available to answer any concerns. Pros: close to slopes (though still have to drive); comfortable bedrooms each w/bathroom; adequate kitchen and dining areas; outdoor hot tub (though temperature too hot to stay in for long); decent price for value; nice, responsive owner. Cons: living area too small for hanging around in together; window views to blank wall/parking/street; some road noise (generally not too loud); occasional barking dog upstairs; overall cramped indoor space. Cute spot! Super cozy beds! Perfect for two couples to explore the area. The beds had foam toppers & were really cozy! Place was clean & had everything we needed. We enjoyed our stay. The condo was clean with comfy beds. The hot tub and pool were great for relaxing after hiking and exploring Emerald Bay. We spent a day at Sand Harbour relaxing in the beautiful surroundings. We would stay here again. 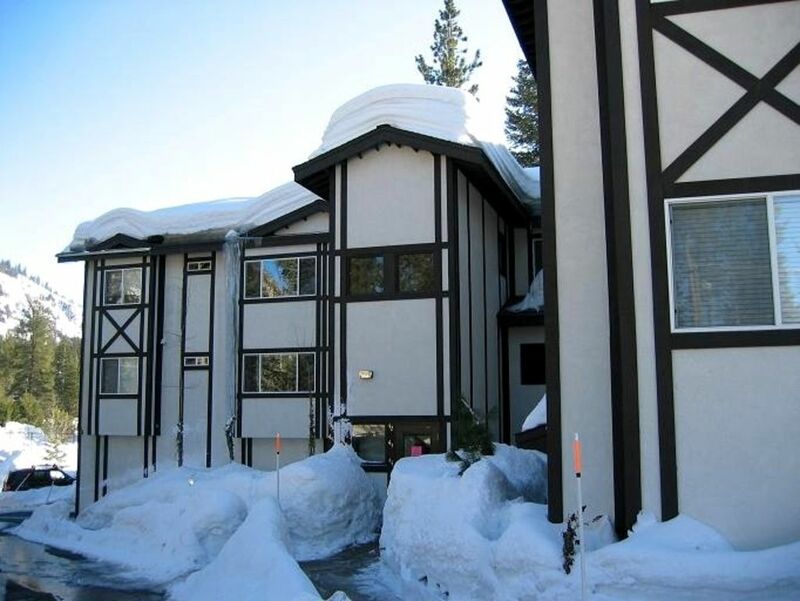 Very comfortable, well appointed condo convenient to Squaw Valley and Lake Tahoe. While there is some noise from the nearby road, it is not disturbing and we slept well with the windows open during our summertime visit. The owner is also very friendly and communicative, and refunded our security deposit without delay after we vacated. A cancellation more than 30 days from the arrival date will receive a full refund. Cancellations of 30 days or less will receive a refund of the $300 security deposit. Rent payments for cancellations of 30 days or less will only be refunded if the property is re-rented. Arrival time is 4 pm; Departure time is 11 am.